LUXE Models Blog: The Red Carpet Prankster Has Struck Again! The Red Carpet Prankster Has Struck Again! Believe it or not, the red carpet prankster has struck once again, so make some popcorn and sit down, as Luxe Models tells you all about it. Funny Prankster or Scary Stalker? We’re honestly not sure if we love or hate the red carpet prankster here at Luxe Models. Admittedly, taking a celebrity down a notch or two is something we like seeing, but he does have a tendency to go too far. Let us explain. 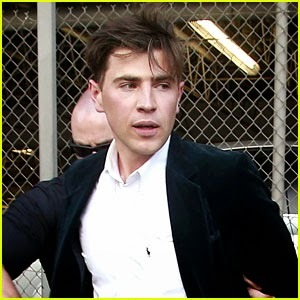 Ukrainian media personality, Vitalii Sediuk, seems to have made it his mission in life to hound the celeb set, as they’re swanning in their designer threads down the red carpet. It can be hilarious, but when he does stuff like punch Brad Pitt, or kiss Will Smith, of which he has done both before, he kind of crosses from funny prankster into the realm of scary stalker. He was most definitely the latter in his latest stunt, which took place last week. So what did he do? Well he tackled Kim Kardashian West while she was sashaying down the red carpet for the Balmain show at Paris Fashion Week. Gossip site Digital Spy featured footage of the incident last week, and you can clearly see the reality star’s legs being tackled by the arguably mentally unhinged prankster as she gets out of a car. However, he was quickly lifted away by security, who then went on to help Kardashian West, along with her husband Kanye and mum Kris Jenner, into the building. Obviously, the Kardashian camp has said absolutely nothing about this at the time of writing – they’re not likely too, but a spokesperson for the celebrity hounder has commented. All they said was that Sediuk did manage to tackle Kim’s legs. That’s not really helpful, is it? Nothing Should Draw Attention Away from Paris Fashion Week! Was there actually any point to this? We admit, it gave us something to talk about around the water cooler, but there’s one reason we’re really annoyed about it. It drew attention away from Paris Fashion Week. That is no in way acceptable, as it featured some exciting summer 2015 trends we can’t wait to have stocked in our wardrobe! For more stories and updates like this, be sure to stay in touch with Luxe Models on Facebook!